Pickford offers a vast array of pneumatic and electric automation solutions – Pneumatic Actuators, Electric Actuators, Rack and Pinion Actuators, Scotch Yoke Actuators as well as Handwheel operated Valves. Both Electric Actuators, Pneumatic Actuators are available for sale in Western Canada - including British Columbia, Alberta, Saskatchewan, Manitoba, as well as Eastern Canada. Contact us today for your Valve Automation solution requirements. 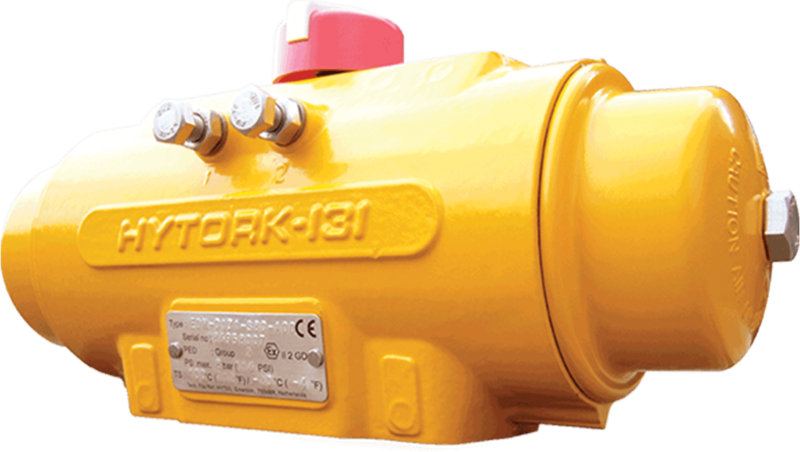 Series 75 Electric Actuators are used throughout the world for on/off, throttling, variable cycle and any analog or digital control. 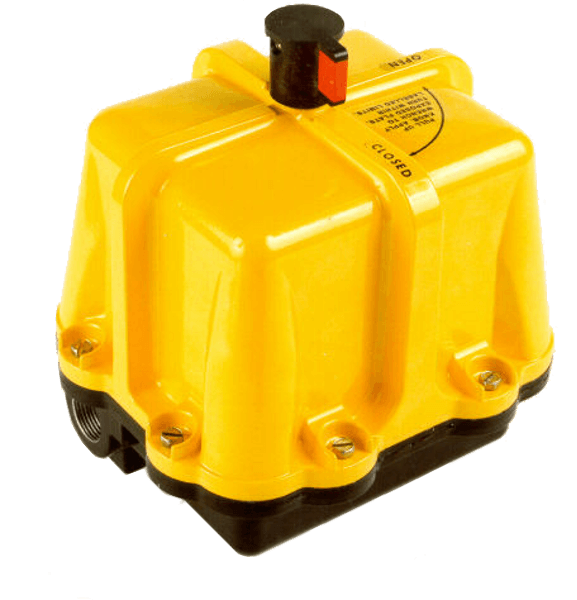 One of the most reliable actuators on the market, it is lightweight, compact and powerful. A time-tested, high-quality state-of-the-art electric actuator for remote control of quarter-turn valves and other rotary devices. Simple, compact and reliable. 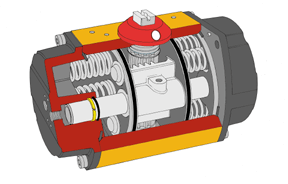 Its split phase capacitor AC reversing motor or DC motor drives a valve through a sealed, permanently lubricated gear train which offers lifetime, maintenance-free operation. The Series 75 is available in eight CSA approved sizes, and produces torque to 3000 in-lbs. 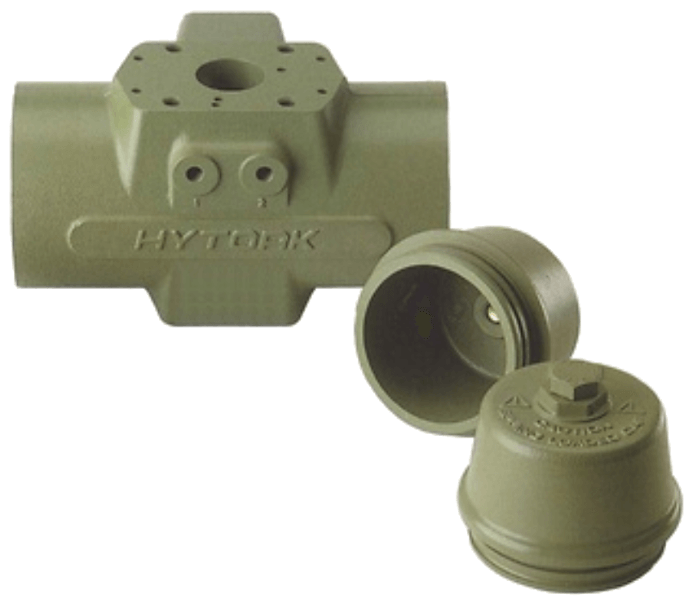 Housings are designed to TYPE 1 General Purpose, TYPE 4 Watertight, and TYPE 7, Class I, Div. 1 and 2, Group C, D and TYPE 9, Class II, Division 1 and 2, Group E, F, and G. A combined location TYPE 4, 4X, 7 and 9 enclosure is also available. 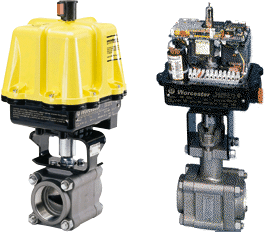 Series 75 actuators may be used on Worcester Controls complete line of ball valves, other quarter-turn valves of devices requiring rotary operators. Moreover, their ability to provide power in both directions through selected arcs from 20 degrees through 300 makes them ideal for control of heating, ventilating and air conditioning duct systems and automatic, remotely operated equipment. 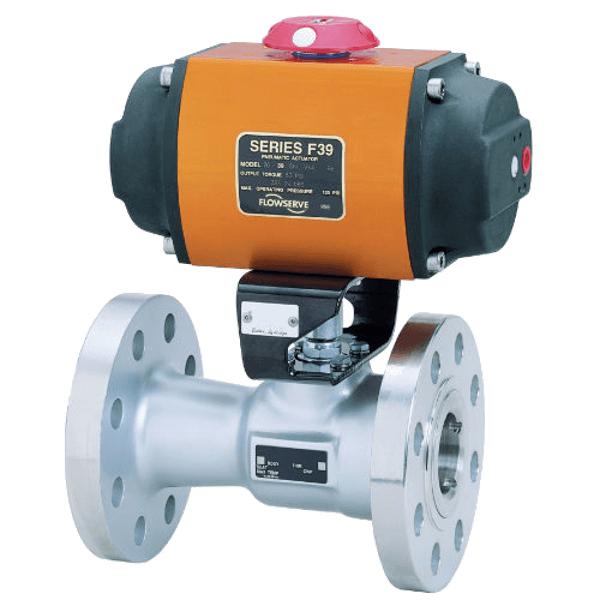 The Series F39 Pneumatic Actuator design is based on the opposed rack-and-pinion principle utilizing piston guide rods to guarantee part alignment. 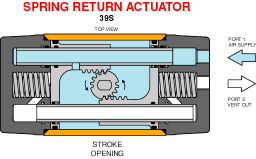 The fully supported guide rods minimize friction and wear between the pistons and the body bore. 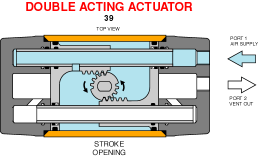 Unique unrestricted air flow through guide rods gives fast operation speeds. Limit switches, solenoid and diagnostics integrated with the actuator. There’s never been this much performance in such a small package - until now. 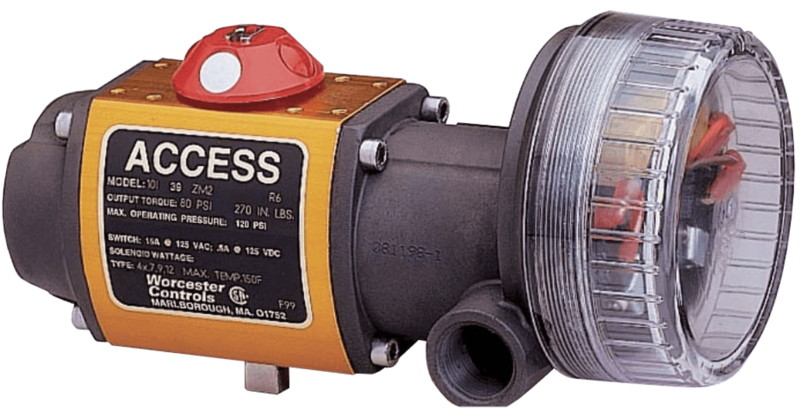 ACCESS™ is an industry innovation which integrates the pneumatic actuator, limit switches, solenoid and diagnostics into a single package! The ACCESS™ is available for either conventional wiring applications or for simple communications with the most common digital protocols. The ACCESS™ is significantly more compact than conventional actuators with accessories and eliminates unnecessary brackets, couplings and additional enclosures. 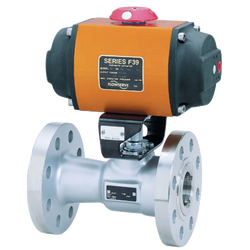 Advanced digital technology provides instant valve/actuator status. A simple cable connection - for both power supply and communications - reduces engineering time, wiring and installation costs. Combine quality, reliability and economy into a single actuation package. Its rugged heavy duty body is made from a high strength LM25 aluminum casting designed to prevent damage from dents, shock or fatigue. 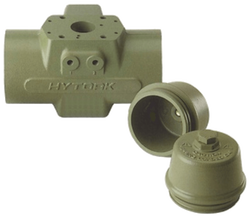 A Hytork actuator is modular in design and is field convertible from double-acting to spring-return configurations and vice versa. Our huge inventory of Pneumatic Actuators & Electric Actuators allows for fast service, and quick availability. Our vast supply includes top rated products that comprise of Flowserve Worcester Series 75 Electric Actuators, Flowserve Worcester Series F39 Pneumatic Actuators, Flowserve Worcester ACCESS™ Integrated Pneumatic Actuators, Emerson Hytork Excel (XL) Series Pneumatic Actuators, and Emerson Hytork Excel Hytork Excel (XL) Commando Pneumatic actuators. Our inventory of Pneumatic Actuators & Electric Actuators is available for sale from our 40,000 square foot - Edmonton, Alberta warehouse for Western Canada - including British Columbia, Alberta, Saskatchewan, Manitoba, as well as Eastern Canada. (Product availability is territory dependent) Contact us for your automation solutions.